The Highway Nazarene Church Teen Bible Quiz Teams travelled to Madisonville, Kentucky to compete in the first Kentucky District Teen Bible Quiz of the 2018-2019 season on Saturday, September 8, 2018. Three teams from Highway Nazarene Church competed in the round robin tournament with seven other teams. The Highway Hooligans team was undefeated and earned 1st place overall in the tournament. Highway Hooligans is comprised of Eli Rains, Ethan Rains, and Shaun Radford. 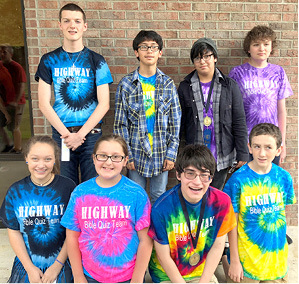 The Highway Hippies team earned 3rd place overall in the tournament. Highway Hippies is comprised of Sidney Hess, Saylor Hess, and Seth Mason. Four Highway quizzers placed in the Top Ten Novice Division. Individually, Shaun Radford was 9th, Seth Mason was 7th, Kane Cross was 5th, and Saylor Hess was 2nd. Four Highway quizzers also placed in the Top Ten Experienced Division. Individually, Lex Marcum was 10th, Mattie Honeycutt was 9th, Eli Rains was 2nd, and Ethan Rains was the #1 quizzer overall! The teams are coached by Ammie Marcum and Teresa Scott. The quizzers are studying the book of John this year. Their next quiz will be in October in Louisville. Thanks to Bro. Bobby Grant and Highway Nazarene Church for supporting this ministry! Quiz team members pictured above are: Front row – Sidney Hess, Saylor Hess, Lex Marcum, and Kane Cross. Back row – Seth Mason, Ethan Rains, Eli Rains, and Shaun Radford. (Not pictured: Mattie Honeycutt).